After over a year of bargaining and mobilization, CWA's Piedmont Airlines passenger service agents won major raises, improved benefits, and other gains in a new tentative contract agreement reached last Friday. The agreement makes significant improvements to the agents' collective bargaining agreement. Two-thirds of the agents will receive at least a 7% raise in the first year of the contract, which includes stronger healthcare benefits, vacation policies, and steady opportunities for raises. "Courageous passenger service agents have been standing up for family-sustaining jobs at American Airlines, and it's because of their determination and commitment to winning a fair contract that thousands of hard-working agents at Piedmont will see big improvements in pay and benefits after this long and tough fight," said CWA President Chris Shelton. "Working people joining together in unions to negotiate collectively remains the best way to achieve the fair return on their work that they deserve." "The CWA bargaining team worked hard to reach this agreement, which recognizes the professionalism of passenger service agents at American Airlines' Piedmont subsidiary and the critical role they play in the success of the company," said Richard Honeycutt, Vice President of CWA District 3 and Chair of CWA's Passenger Service Airline Council. For more details on the agreement, click here. CWA filed a complaint with the Department of Labor's Wage and Hour Division on behalf of workers at 11 call centers employed by General Dynamics Information Technology (GDIT), one of the largest federal contractors in the U.S.
CWA is calling on the Wage and Hour Division to investigate systemic and serious wage theft by GDIT. The GDIT employees answer questions, help enroll, and provide other assistance to callers about Medicare programs and the Affordable Care Act under a contract for the Centers for Medicare and Medicaid Services (CMS). The New York Times published this story about the complaint against GDIT for wage theft. Several GDIT workers came to Washington, D.C., to alert senators, members of Congress, and congressional staff to GDIT's misclassification and wage theft that has cost millions. Senator Bernie Sanders (I-Vt.) and Representative Keith Ellison (D-Minn.) were among the lawmakers who met with the group. Adrian Powe is a durable medical equipment specialist in Hattiesburg, Miss., working with customers and equipment suppliers to make sure the Medicare recipients get the oxygen, wheelchairs, hospital beds, and other equipment they need. He talks to as many as 60 customers a day, and earns $9.64 an hour. "I've had two rounds of extensive training to get to my current job. It's a lot responsibility and a lot of work. But I'm being paid at a much lower rate. I'm being cheated, and the federal government must hold GDIT accountable. GDIT needs to follow the contract it agreed to," he said. Kathleen Flick is part of the internal support group at the Bogalusa, La., call center. She said that GDIT's wage theft "makes me feel horrible. Stealing from the working poor is really low." Like Powe, Flick loves her job. But she doesn't like being cheated of her rightful wages. "GDIT told us that 'the federal government sets your wages.' So we're calling on the federal government to have real oversight of contractors like my employer so that it stops cheating workers out of their rightful wages. We shouldn’t be treated as cut-rate employees." In a separate development, National Labor Relations Board Region 5 has issued a complaint against GDIT for violating federal labor law and workers' rights at its Alexandria, Va., facility. GDIT workers visited legislators on Capitol Hill this week. Top photo, from left: Clifton Pollock, Kathleen Flick, Swannie Powe, Venus Nelson, Rep. Keith Ellison (D-Minn.), Sedgerick Lee, and Adrian Powe. 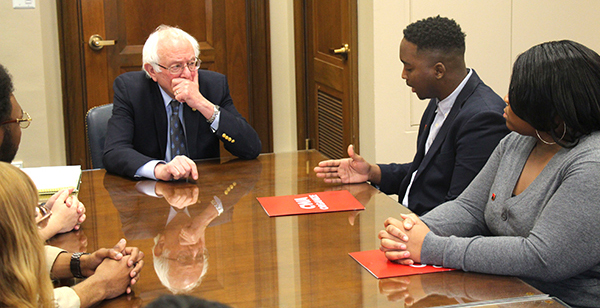 Below: Workers also met with Sen. Bernie Sanders (I-Vt.). Wireless workers rallied in Orlando to support good jobs and quality customer service in the wireless industry. Hundreds of wireless workers from AT&T Mobility, Verizon Wireless, and T-Mobile met in Orlando this week to discuss their plans to improve job security and pay, end extreme sales goals, and curtail offshoring and outsourcing of retail stores, call centers, and technical work coast to coast. 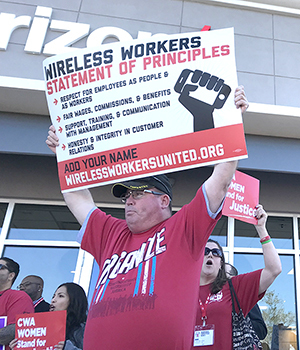 The workers announced that they were forming a network, called Wireless Workers United, to work together to protect good jobs and quality customer service. Honesty and Integrity in Customer Relations. Those attending the meeting showed their support for AT&T Mobility workers across the Southeast who are currently fighting for a fair contract by rallying together in front of an AT&T Mobility store in downtown Orlando. Workers also rallied at a Verizon Wireless store. "It was only by firmly standing together that our Mobility co-workers won a precedent-setting contract for wireless and retail jobs with first-time job security protections and better, more stable pay," said Nilda Meadows, an AT&T wireless worker from South Carolina. "Now, we're heading to the bargaining table to win for our families and communities. We are standing strong to make sure the industry operates with integrity and protects and preserves good jobs for our communities." Learn more and read the full Statement of Principles at wirelessworkersunited.org. 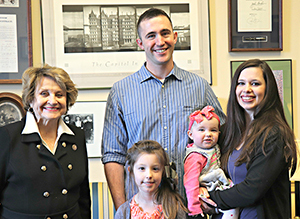 CWA member Dustin Newman and his family joined Rep. Louise Slaughter (D-N.Y.)(left) for the State of the Union address. U.S. Representative Louise Slaughter (D-N.Y.) hosted CWA Local 1170 member Dustin Newman at the State of the Union address, to spotlight the Trump administration’s failure to save good jobs. Newman, an Army reservist from Rochester, N.Y., was laid off in January along with 31 other Frontier Communications employees as part of a larger, company-wide downsizing. In his response to President Trump's address, CWA President Chris Shelton noted that despite Trump's campaign promises, working people are worse off after the first year of his presidency. "The tax cut that the President and Republicans jammed through Congress gives billions of dollars to corporations and the 1 percent at the expense of the rest of us," Shelton said. "Some companies have doled out bonuses, and those extra dollars always make a difference to working families. But instead of putting more money into creating good jobs and increasing wages, these corporations have made it clear that their tax break will be used mainly to enrich executives and shareholders." Read President Shelton's full statement here. Employees at Jacobin, a Brooklyn-based print and online magazine, ratified a first-time agreement with the company through December 15, 2021. The agreement includes pay increases, improvements to health care and retirement benefits, and more. "I hope the existence of our union at Jacobin serves to rebuke any boss elsewhere who claims his or her publication can't afford a union," said Jacobin Guild member Alex Press. 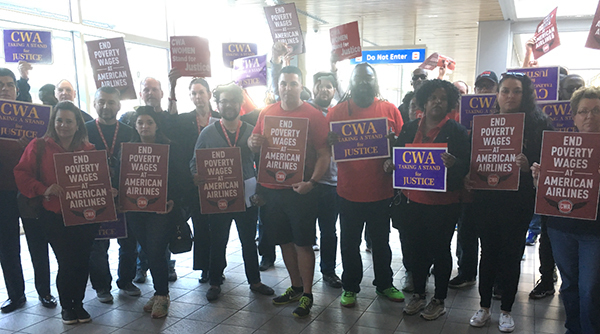 As bargaining continued this week, Envoy Airlines workers, CWA members and allies rallied at the Orlando Airport to fight for fair wages. The Federal Communications Commission (FCC) Broadband Deployment Advisory Committee (BDAC) adopted a recommendation that would mandate the use of contractors to move telephone company equipment to make room for new attachers' equipment. This is work that is currently performed by trained, skilled, career employees at AT&T, Verizon, Frontier, and other employers. "The BDAC recommendation threatens public safety," said CWA President Chris Shelton. "Mandating contractors rather than trained career employees to do this work can lead to dangerous conditions for the public, such as ungrounded wires and heavy terminals hanging without adequate support. The BDAC recommendation also threatens the good middle-class jobs of thousands of workers across the country, and violates contracts negotiated by our union with our members' employers." "CWA supports common sense proposals to streamline pole attachment work to facilitate broadband expansion consistent with protections for public and worker safety and respect for legally-binding collective bargaining agreements. The BDAC recommendation fails on both accounts. The FCC should reject the BDAC's radical One Touch Make Ready recommendation," Shelton said. Electronic and Instrumentation Technicians working for government contractors in Virginia Beach voted to join IUE-CWA earlier this week. The 52 technicians, who work for JanTec, AECOM, and Bering Sea Environmental, maintain tracking devices on U.S. Aircraft and Warships. The NewsGuild-CWA filed an Unfair Labor Practice complaint earlier this week against Lanetix, a tech development company, after all the engineers in the company were fired soon after they announced plans to join the union. The company plans to offshore the work to Eastern Europe. "My coworkers and I, fifteen in all, were fired on Friday in an illegal effort to bust the @news_guild union at @Lanetix," Bjorn Westergard tweeted. "Those of us who organized only wanted a better company for our friends and coworkers," he wrote. The company has offices in San Francisco and Arlington, VA, with affected engineers working at both sites. "We're going to fight this as hard as we can," said Cet Parks, executive director of the Washington Baltimore NewsGuild, CWA Local 32035, which is supporting the workers. Top executives at CenturyLink, who are set to receive millions in bonuses as a result of CenturyLink's purchase of Level 3 Communications, are leaving the working people who have built the company behind by cancelling bonuses and merit pay and eliminating their jobs. "CenturyLink President Jeff Storey's gain is a huge loss for working families and their communities," said Brenda Roberts, Vice President of CWA District 7, which represents over 11,000 workers at CenturyLink. "CenturyLink claims that low cash flow prevented them from paying holiday bonuses last year, yet they somehow found enough cash to pay his $6.6 million signing bonus. Storey also stands to make millions more in performance pay and stock options. We're concerned that we will see more cuts aimed at boosting the value of those stock options since Wall Street rewards the kinds of short-term gains companies achieve by laying off workers and cutting back on customer service." Storey is not the only executive who stands to benefit. Executive Vice Presidents Stacy Goff and Chief Financial Officer Sunit Patel will also receive millions of dollars in retention bonuses. President Trump and Republican leaders in Congress promised working people that last year's corporate tax cut would result in companies using their windfall to increase wages and invest in creating more jobs. That's clearly not the case at CenturyLink. Last month members of CWA Local 1102 hosted a conference in Staten Island together with local immigrant rights and climate change groups and other activists. 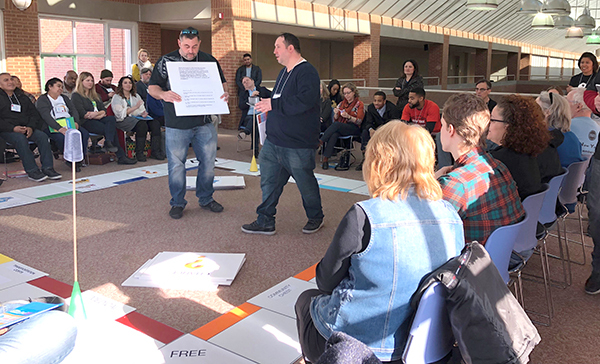 During the workers' rights session, they set up a floor monopoly game, which illustrated the effects of income inequality by assigning participant groups different income levels. The higher the income group, the easier the game was. Read more at https://www.siunited2018.org/. On Saturday, February 24, CWA members will join thousands of working people and our allies and stand up for our freedom to come together in strong unions and fight and to demand an end to a system that's rigged against working people. Corporate elites, extremists, and corrupt politicians who do their bidding have rigged the rules of our economy and our democracy against us. Now wealthy special interests want to further rig the system in a Supreme Court case called Janus v. AFSCME Council 31, which attempts to divide working people and limit our power in numbers, because unions give workers a powerful voice in speaking up for themselves, their families and their communities. Fifty years ago, Dr. Martin Luther King, Jr., joined striking sanitation workers in Memphis, Tenn., as they fought for the freedom to join together in a strong union and for dignity and respect on the job. On February 24, working people and our allies will rise up to defend the very freedoms for which Dr. King fought and died. For more information and to find and event near you, visit www.itsaboutfreedom.org.